Microsoft launched a new OneNote Mobile smartphone application in early February 2012, adding Android to the list of client platforms now supported by OneNote. Peter O'Kelly provides an overview of the new app and its role in the expanding OneNote product family. Microsoft pleasantly surprised a lot of OneNote fans in early February 2012, when it announced and released OneNote Mobile for Android, a version of OneNote Mobile available for Android smartphones (running Android 2.3 or later). It can also run on Android tablets, but has not been tested on or optimized for Android tablet devices. The application is available in a wide variety of global regions (see the OneNote Blog introductory post for a list of supported international regions). It is free when used for creating up to 500 notes (and also free for reading an unlimited number of notes), and costs $4.99 for an unlimited note authoring license. The rest of this article provides an overview of the new OneNote Mobile for Android client, highlights some limitations, and concludes with some general projections about what might happen next in the rapidly expanding competition between OneNote and Evernote. The new OneNote Mobile for Android application is in most ways similar to OneNote Mobile for iPhone (see "OneNote Mobile for iPhone: OneNote Mobile Goes Multi-platform") and OneNote Mobile for Windows Phone (see "The True Gem of Windows Phone 7"). It provides a small but useful subset of the features in OneNote 2010, the OneNote family foundation that's included with all releases of Microsoft Office 2010. As with the other OneNote Mobile clients, OneNote Mobile for Android requires a Windows Live ID to be used in conjunction with Windows Live SkyDrive, a service Microsoft provides, at no cost, to store shared OneNote notebooks in the cloud and to synchronize notebooks across the various OneNote clients. To be precise, you can use OneNote Mobile and its default "Personal (Web)" notebook without a Windows Live ID (that is, without leveraging SkyDrive), but it's then not very useful. I believe Microsoft intends for the OneNote Mobile clients to be used as mobile satellites for OneNote 2010, making it possible for Windows OneNote users to seamlessly take a subset of their notebooks with them on their smartphones to view and selectively update information, capture images in OneNote, and perform other note-taking activities. The next five figures include images from a OneNote Mobile for Android introduction post on the OneNote Blog and from the Android Market page for the application. Figure 1 captures an example of the OneNote Mobile Recent Notes interface, which, as its name suggests, presents a list of notes recently viewed on the smartphone. This is a handy view option that is not currently available in OneNote 2010 (although you can see a list of notes recently accessed in OneNote 2010 by right-clicking the OneNote program icon in the Windows 7 taskbar, if you're using Windows 7). In this case, the user scenario involves a mixture of work-related notes, home projects, and a vacation plan. 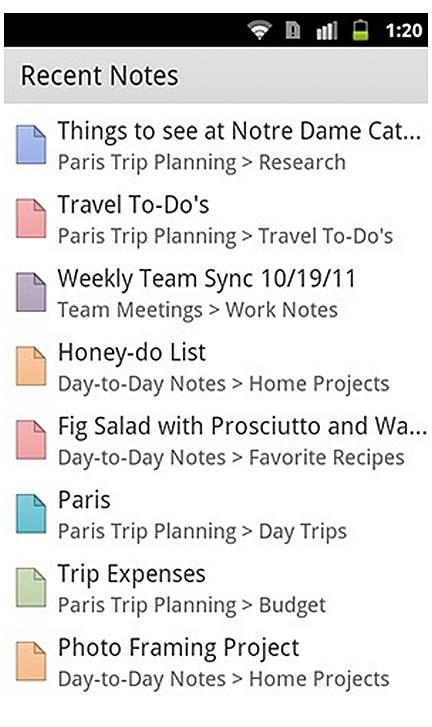 As suggested in Figure 1, the recently viewed notes can reside in different OneNote notebooks (for example, "Paris Trip Planning" and "Team Meetings"). Figure 2 continues the scenario, with a view of notebook sections in the Paris Trip Planning notebook. OneNote Mobile is very handy for organizing information pertaining to trip details such as reservations and planned day trips. 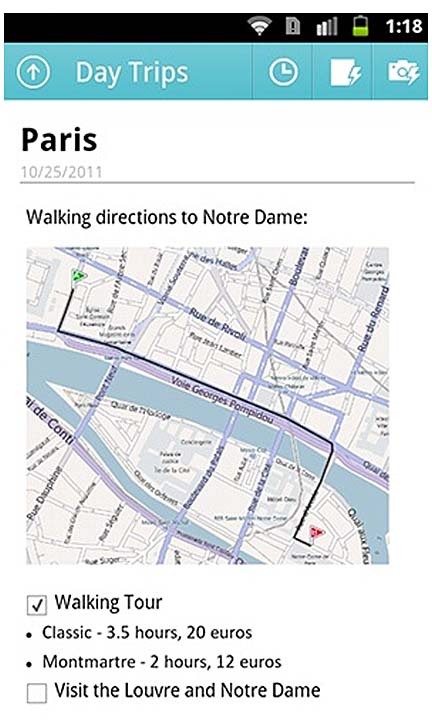 Figure 3 captures an example of a day tripa walking tour of Paris, in this case. The Paris details are captured in a note in the Day Trips section within the Paris Trip Planning notebook. 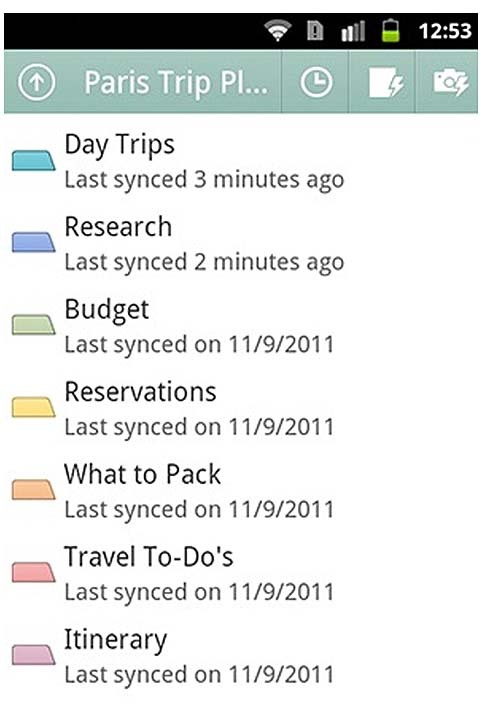 OneNote Mobile for Android also supports section groups (when they're created in OneNote 2010). 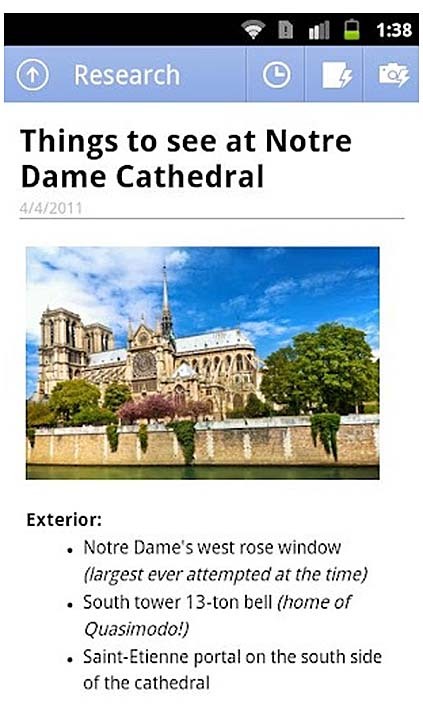 Figure 4 continues the OneNote-as-tour-guide example scenario with a note capturing tourist highlights for the Notre Dame Cathedral visit stop on the Paris walking tour. As these examples suggest, OneNote Mobile for Android is a very handy means of making information captured in notebooks readily accessible to Android smartphone users, with support for a mix of text, images, checklist items, and other formatting options. 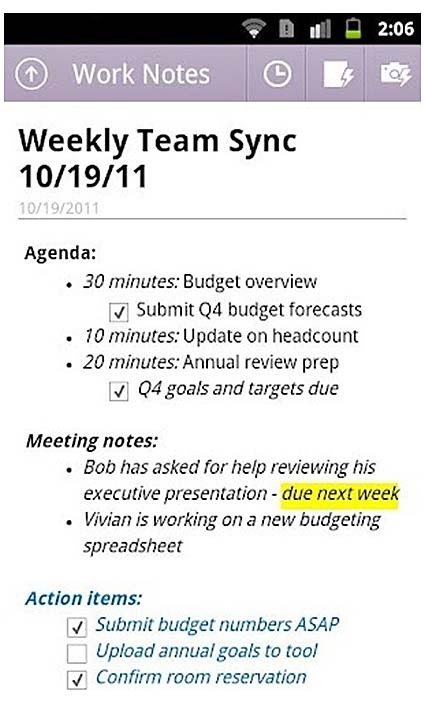 Figure 5 is an example of a more mundane but probably much more common user scenario, using OneNote Mobile for Android for a collection of agenda and to-do items for a planned meeting. Figure 5 also provides an example of the capability to display highlighted text. From what I can discern, the text must be highlighted in OneNote 2010 or OneNote Web App (you can't create new text highlights in the OneNote Mobile client). Although it is correctly displayed in the Android client, strangely it is not in some of the other OneNote client apps, such as the OneNote for iPad app.